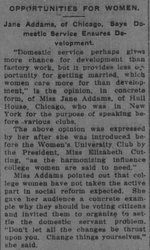 Jane Addams, of Chicago, Says Domestic Service Ensures Development. 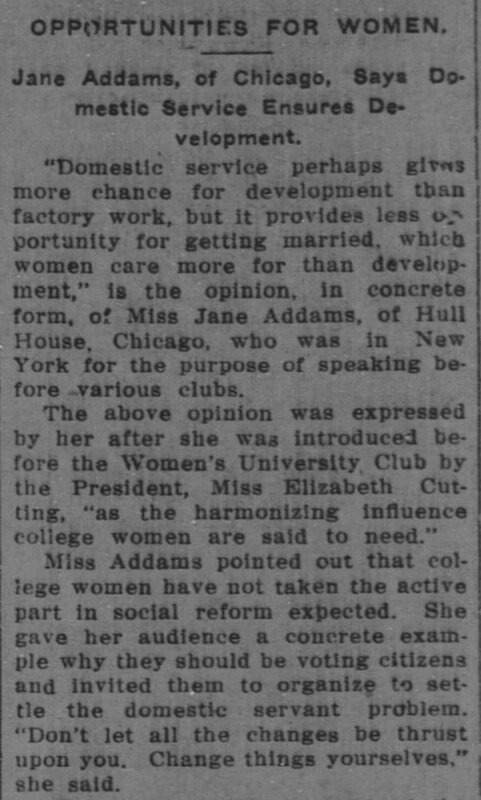 "Domestic service perhaps gives more chance for development than factory work, but it provides less opportunity for getting married, which women care more for than development," is the opinion, in concrete form, of Miss Jane Addams, of Hull House, Chicago, who was in New York for the purpose of speaking before various clubs. 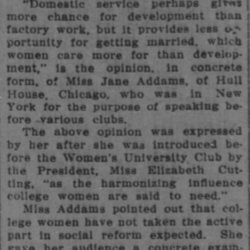 The above opinion was expressed by her after she was introduced before the Women's University club by the President, Miss Elizabeth Cutting, "as the harmonizing influence college women are said to need." 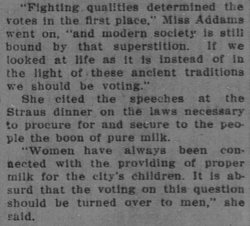 "Fighting qualities determined the votes in the first place," Miss Addams went on, "and modern society is still bound by that superstition. If we looked at life as it is instead of in the light of these ancient traditions we should be voting." 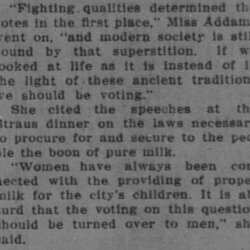 She cited the speeches at the Straus dinner on the laws necessary to procure for and secure to the people the boon of pure milk. 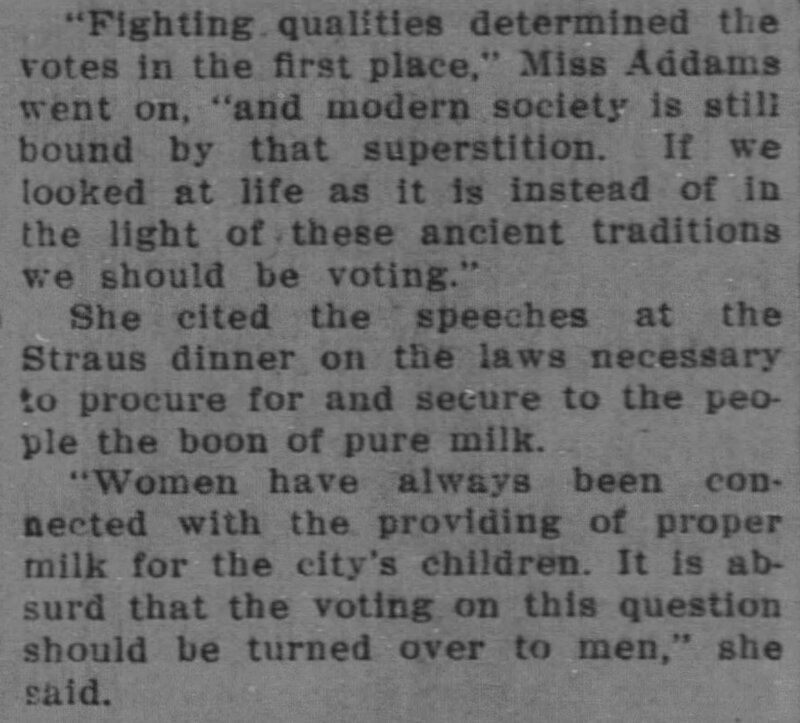 "Women have always been connected with the providing of proper milk for the city's children. It is absurd that the voting on this question should be turned over to men," she said. 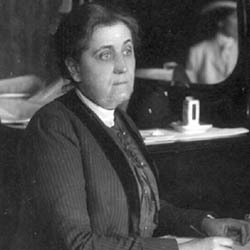 Jane Addams, "Opportunies for Women. ", Brazil Daily Times, July 29, 1914, page 2. 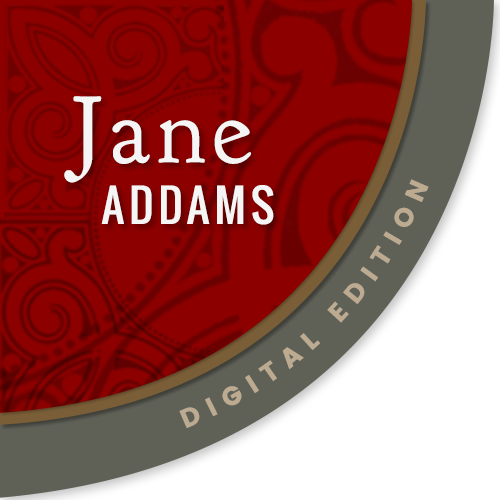 Addams, Jane, “Opportunities for Women, July 29, 1914,” Jane Addams Digital Edition, accessed April 25, 2019, https://digital.janeaddams.ramapo.edu/items/show/9828.